For Taku Morisaki, a high school boy living in the Kochi Prefecture, there was little else that occupied his attention other than his day to day life. Going to school, working a part-time job, and hanging out with his friends had become his entire world. It isn't until Taku's good friend Yutaka Matsuno introduces him to Rikako Muto, an enigmatic young lady transferring from Tokyo, that his life begins to turn upside down. Will these encounters bring the two closer together, or simply push them further away? Ocean Waves (also known as 'I Can Hear the Sea') is a Studio Ghibli animated film that was created specifically to be released on Nippon TV. The film is an adaptation of a novel of the same name written by Saeko Himuro. The film itself was directed by Tomomi Mochizuki and written by Kaori Nakamura. 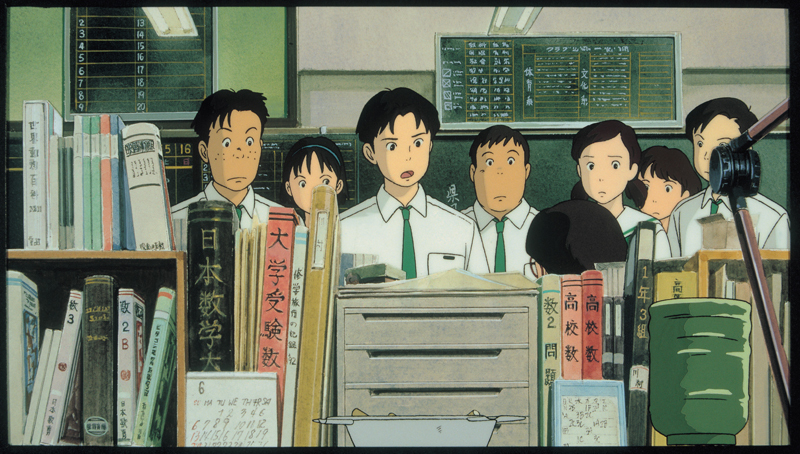 The movie aired on Japanese television on May 5th, 1993 and had never received a wide release. It wasn't until December of 2016 that the film received both a remaster and a limited theater release, courtesy of GKIDS, along with a home video release set for the spring of 2017. Other than being the first direct to television film to come out of Studio Ghibli, the film is notable for being one of the few Studio Ghibli films not directed by studio founders, Hayao Miyazaki or Isao Takahata. 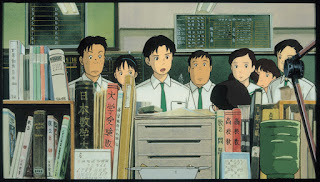 The film itself had been an opportunity for the younger members of Studio Ghibli's staff, at the time, to try their hand at creating an animated film of their own design. 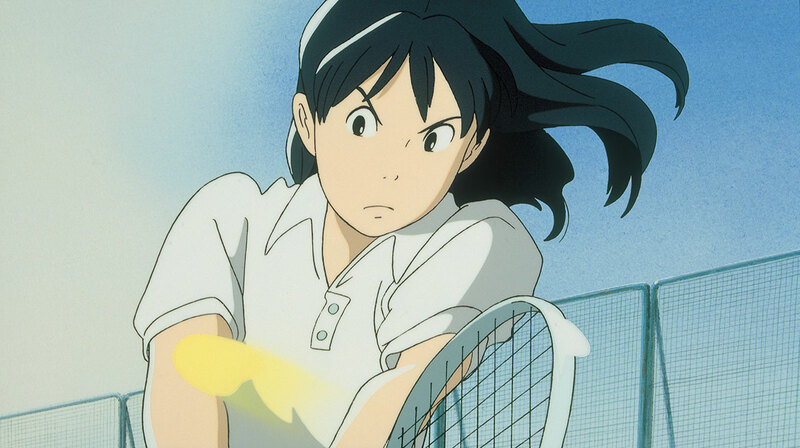 Much like Isao Takahata's film 'Only Yesterday', Ocean Waves is a slower paced, slice of life drama that chooses to focus more on real life situations and dilemma its various characters than an emotionally driven plot. A fact that, I believe at least, is part of the reason that it took so long for the film to get a release outside of Japan. 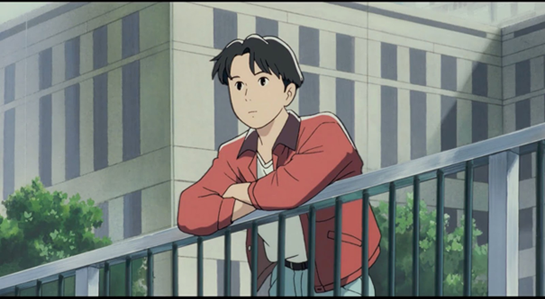 Despite sharing some similarities to Only Yesterday in that most of the story is told via flashback from our main character, there are plenty of visual and story elements that make Ocean Waves unique. Both in a good way, and not so good way. Let's start with a look at the animation itself. Though it shares common traits of other Ghibli films of the time (the design of the characters faces, provided by Katsuya Kondo, )very much in line with Ghibli style) there is a very down to earth nature to the character movement and expressions. The backgrounds themselves seem to resemble photographs of the various locations visited in the movie, like snapshots taken during summer vacation. This visual is even taken a step further and used as a form of transition between scenes. showing an image of the setting surrounded by a white frame, which the editing cuts back and forth before settling in on the scene and the ongoing action. Though I understand the use of this editing technique and even admit that it served the purpose of condensing several years of high school into one movie, it was definitely jarring at times. Putting the brakes on the movies already slow pacing. The characters that take center stage during this movie are your pretty standard slice of life fare. Taku is a normal high school teen who's personality and motivations that are typically associated with boys his age. The same can even be said for his good friend, Yutaka, as he pines for Rikako. However, it is only when the two starts to interact with Rikako that we start to maybe relate and even feel for both characters. Speaking of the female lead, I found myself baffled by her as the film continued. A character that had been built up to be the teen girl heartthrob was, in my opinion, the easiest character to hate. Her dialogue and actions throughout the film did little to endear her to me. Rikako is more or less the quintessential insecure teen that acts more on her own wishes and disregards the needs of others.The kind of selfish behavior that always ticked me off when I encountered her ilk in my own high school experience. I found myself becoming irritated with Rikako's antics, but even more so with trying to understand what Yutaka saw in her or why Taku kept going out of his way to aid her (though even starts to question this as the movie continues). It didn't really sink it that this had been the movie's intention all along until the very last 10 minutes. Which made me appreciate the film's unique angle and message even more. All of the situations seen in this movie are events that could have very easily happened in real life during that turbulent time of youth. The film's drama ebbs and flows, a bit like the film's namesake. Each encounter showing us more of Rikako's insecurities and how Taku reactions to her that flesh him out more as a character. But most importantly, the film demonstrates how people have the potential to change as they grow older. How those experiences in life shape who we are and what we want to be. Ocean Waves may not be the greatest hidden gem to come out of Studio Ghibli, but it is still a very important film. Not only is it an exploration of mature storytelling in animation, but the fact that it stood as a testament of what the rest of the Studio's staff was capable of without Miyazaki or Takahata's guiding hand. 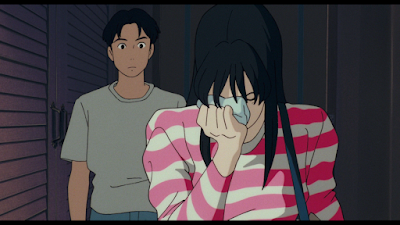 With a realistic and relatable narrative, this is a film that deserves to be seen by as many Studio Ghibli fans as possible. Ocean Waves will continue its limited time theater release until March 10th, 2017. Check here to see if the film will be coming to a theater near you. Keep an eye out for the film's home video release coming sometime in spring, 2017.